Disney Dollars are worth face value at all Disney parks and resorts. That is the only value that is guaranteed. Disney Dollar prices on the collector market are determined by supply and demand. 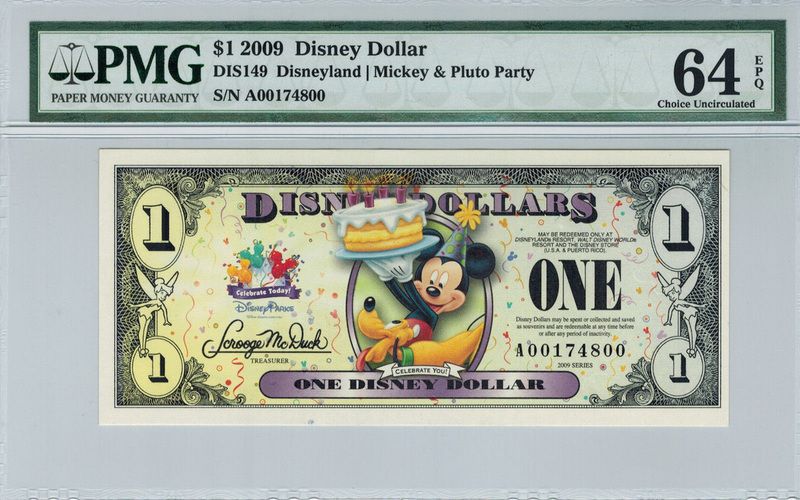 Hard to find Disney Dollars, or those in exceptional condition, can be quite expensive. In this environment, authenticity and a common grading system become very important. That is why many collectors rely on professional grading services to authenticate and evaluate notes using objective, consistent, and well-documented standards. Professional grading services use many techniques, including ultraviolet light and extreme magnification, to determine the authenticity and condition of a note. If a dishonest seller irons a note, adds pigment or otherwise tampers with a bill, it will be detected during this process. Once graded, notes are placed in protective holders made of museum quality materials. Holders are manufactured with anti-counterfeiting features that include holograms, UV-visible watermarks, complex border patterns, certification numbers and more. The notes sold here were graded by PMG or PCGS Currency. These are the two most reputable currency graders in the world, each with years of experience grading thousands of Disney Dollar notes.